Introducing the New Kinesis Freestyle2 Blue for Mac adjustable split keyboard in an ultra-thin design. Dramatically thinner than the original Freestyle Mac, the Freestyle2 Blue for Mac is ideal for both office and travel use. Retaining the same ergonomic features as its predecessor the Freestyle2 Blue for Mac is the only keyboard that adjusts to each individual's unique body type - from petite to large frame. Created with input from ergonomists and health professionals, the Freestyle2 for Mac adapts to the specific needs of each user, minimizing awkward postures, while providing a stylish accent to any workstation. Featuring simple, sturdy adjustment mechanisms the Freestyle2 for Mac is intuitive to configure and use. Interchangable accessories provide features never before available from just one keyboard design. Two optional accessory packages, the VIP3™ and Freestyle V3™ can be combined to provide additional capabilities. These three configurations allow the user to choose features that offer complete separation, adjustable front splay, and adjustable tenting with or without integrated palm supports. Other unique features of the Freestyle2 for Mac keyboard include driverless hot keys for Mac actions and a low-profile design to promote neutral wrist posture, a Pivot Tether™ connecting the two keying modules together and quiet, tactile key switches. Provides total separation of both keyboard modules. Up to nine inches of complete separation of both left hand right keying modules. Sleek, low profile design. 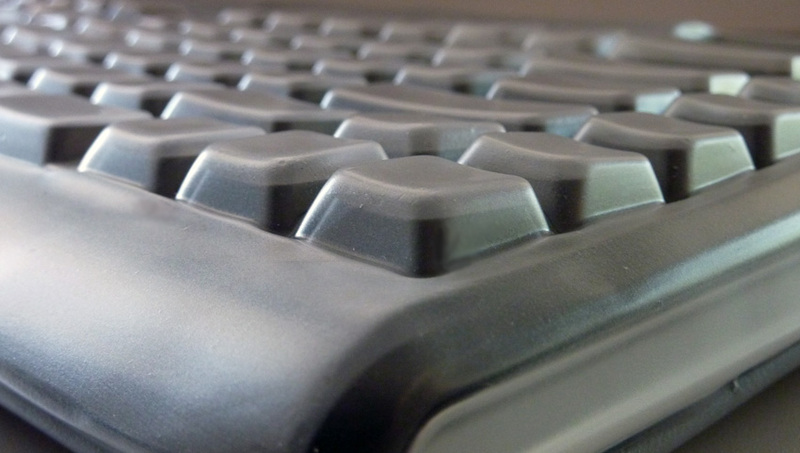 Most keyboards including ergonomic models have a 10 degree positive slope from front to back. These designs tend to bend your wrists. The Freestyle2 has a zero degree slope which minimizes the height, effectively creating negative slope and reducing wrist extension. Narrow Footprint for comfortable mousing and keying. Your mouse if right where you want it - not at arms length! Pivot Tether. Both modules can be connected together by attaching the included flexible pivot tether allowing an infinite range of splay. Double wide Delete and Escape keys. Familiar key layout provides for minimal adaptation. The Freestyle2 utilizes a quiet, low-force, tactile membrane key switch. The typical average maximum key force of a switch is 45 grams. such as the Microsoft 4000 with maximum key forces of over 60 grams. Width: 15 3/8 inches with 0 opening angle selected. Maximum width is 23 inches when fully separated. Height: 7/8 of an inch. The Freestyle2 Blue for PC is available here! The Kinesis Freestyle2 VIP3 accessories attach easily to the base of the Solo Keyboard allowing quick and reproducible slope settings of 10 to 15 degrees. the V-lifter quickly and easily alternates the slope of the keyboard from 5, 10 and 15 degrees, positioning your forearms and wrists in a more comfortable position by reducing pronation. Integrated, padded palm supports ensures that wrists are neutral while resting. 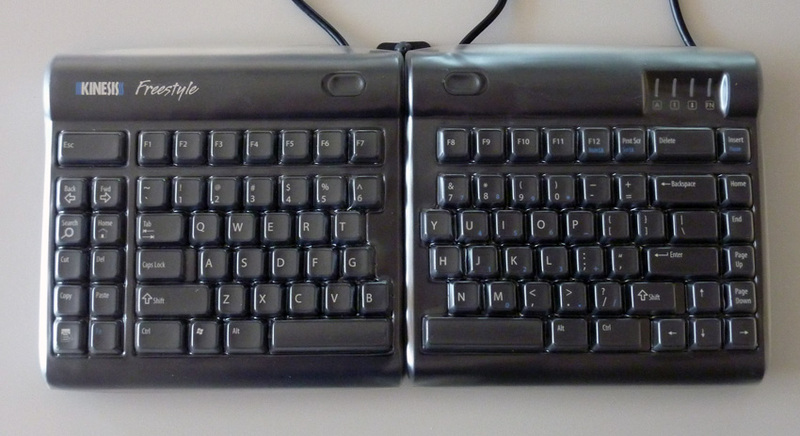 the pivot tether connects the two keying modules of the Solo keyboard together. Disconnect the pivot tether if greater separation is required. Provides a highly stable typing platform with no "bounce". Not compatible with original Freestyle Solo keyboard. 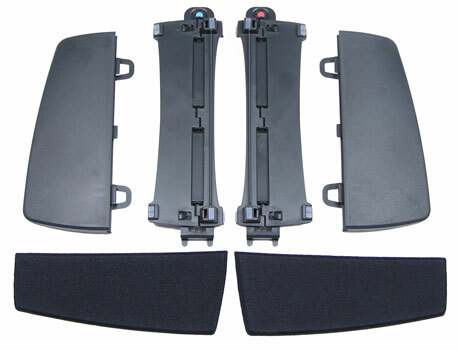 The VIP3 Accessory includes: (1) set of right and left V-lifters, (1) set of right and left integrated palm supports which must be installed prior to using (1) set of replaceable padded palm pads. The Kinesis Freestyle2 V3 accessory attaches easily to the base of the Solo Keyboard allowing quick and reproducible slope settings of 5, 10 and 15 degrees without the use of integrated palm supports. the V3 V-lifter quickly and easily alternates the slope of the keyboard from 5, 10 and 15 degrees, positioning your forearms and wrists in a more comfortable position by reducing pronation. 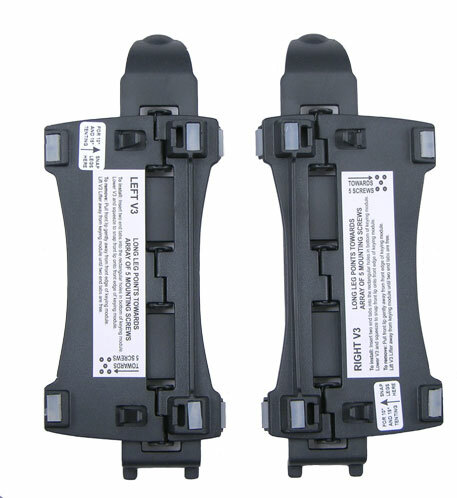 Unlike the VIP3, the V3 does not require the installation of palm supports prior to use. Max Height at 15 degree slope: 3 1/8 inches. Max Height at 10 degree slope: 2 1/2 inches. Max Height at 5 degree slope: 1 7/8 inches. The V3 Accessory includes: (1) set of right and left V3 V-lifters. 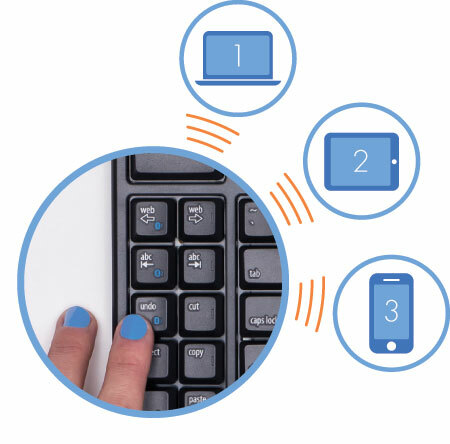 Fentek's Custom keyboard protectors are made of a thin soft polyurethane material that is form fitted around each key, still allowing full use of the keyboard without interfering with typing speed or accuracy. Our seals are designed to wrap around the edge of the keyboard for easy installation and removal. Every effort is made to ship Same Day order is received by 3:00 pm MST. or complete the Secure "Order Form" by clicking the Order Form button below. complete "InfoRequest" by clicking the Info Request button below. © 2018 Fentek Industries, Inc. Quality Computer Input Solutions!